Stella was found living on her own in Wild Cat Canyon when she was about seven months of age. Flea-bitten and tick-ridden, she was rescued by Help for Homeless Pets and was given refuge in foster homes for two months. Then, just in time for Christmas, Stella, Tom (my husband) and I became a family on December 5, 1998. 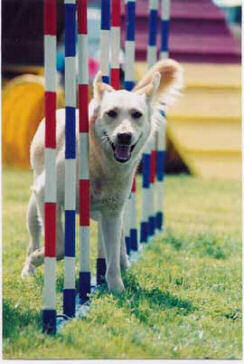 The following summer Stella and I began agility training with Sandy, and first competed at an agility trial in April 2000. At the time, Tom and I used to joke that Stella was really a cat in dog's clothing. She was aloof, and definitely had her own agenda. Her reserved demeanor was likely the result of her difficult puppy-hood, and at the agility trial she was much more interested in doing her own thing--sniffing and exploring the ring--than in following my commands. With slow and patient progress, and lots of encouragement from Sandy, Stella has become not only a dog, but an agility dog. She's happy, confident and secure, and has become truly bonded to Tom and me. And we are so proud of her! At the NADAC trial held by Ups-n-Downs Agility Club on November 16 & 17, 2002, Stella completed her Novice Regular and Novice Gamblers titles with two first-place ribbons and one second-place ribbon. In addition to the excitement and satisfaction of doing well as a team of two, agility training has given Stella and me an opportunity to get to know some wonderful people and to make some great canine friends. Thanks to Sandy and to all of our training buddies who help keep us on course! Thanks again!